I admit it. This was my strangest purchase ever on Amazon. It was a bit of an impulse. But in my defense, I have one of these in my home, so I knew exactly what I was buying. I admit it. This was my strangest purchase ever on Amazon. It was a bit of an impulse. But in my defense, I have one of these in my home, so I knew exactly what I was buying. Uh, yeah… (clears throat) … I purchased an assistive listening device for a blind and deaf baby goat. 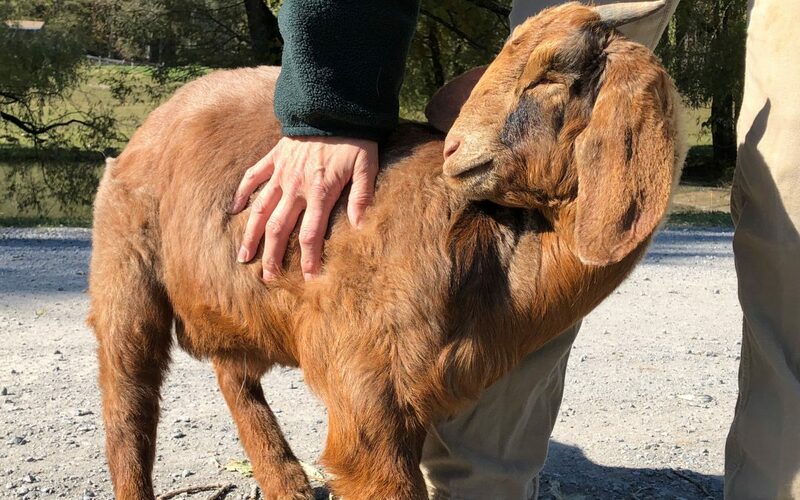 Yup, Leo the baby goat arrived at the Catskill Animal Sanctuary this past summer. His preliminary health check confirmed he was blind. He was only two months old, so he was born with no vision. But thankfully for Leo, the animal care team at Catskill Animal Sanctuary is experienced with special needs. Over the years, the team has welcomed and worked with over a dozen blind animals. So, when Catskill posted a video of baby Leo, the social media world fell in love. Little Leo was in great hands and his new fan club was relieved he landed at this amazing sanctuary in New York state. The animal care team, directed by Kelly Mullins, observed a surprising response from Leo. Or… perhaps it’s more accurate to say his lack of response. The team realized Leo was not hearing very well. What they could not know when they rescued him was that little Leo’s auditory system was also compromised. They updated social media to say Leo was not responding to normal sounds. He had some degree of hearing loss and they would investigate further. I was born with a genetic hearing loss that affected me by the time I was four or five years old. Seeing the social media update that little Leo had hearing loss, well… my heart sank. Oh, sweet little Leo… I get that. I understand about your wonky hearing. I know how it can isolate us from others and our world. Hearing loss is darn tricky. We just don’t know that much about it. And since hearing loss is called an Invisible Disability, the animal care team was unable to detect this sensory issue in the preliminary health screening. My own hearing loss went undetected for five decades. Yeah, I functioned with this invisible health condition until I was 52 when I received my first diagnosis. As you can imagine, it’s not easy to diagnose hearing loss in an animal. It’s tough enough for humans to get a diagnosis, as there are few clues that something is wrong. Of course, now that I’ve learned so much about my own hearing loss, I can see the little hints over the years. But again, society at large is not aware of how to spot and identify auditory system diseases. Over the next week or two, Catskill posted videos of the team working with Leo. They sat on the grass and pounded the ground to see if Leo could feel the vibrations. They played music and spoke to him. They were trying everything to find solutions for Leo. I admired how they shared their challenges during these early weeks. I watched their videos many times. Then, it hit me! Vibrations! Yes, very smart of the Catskill team! Their clever experiments triggered a parallel to my own life with hearing loss. You see, my audiologist in 2013 informed me that all my life I had not heard my own voice. What I heard was a combination of two sound sources. My outer ears picked up the sound vibrations that traveled in the air from loved ones speaking to me, from the birds singing in the trees, and from all environmental sources. The second source of sound was my own internal vocal chords vibrating in my throat as I spoke. Those vibrations traveled up my jaw bones and into both ears. So, this combination of vibrations (through the airwaves and through my jawbones) effectively tricked me into believing my hearing was normal. But my auditory system is not normal. Mine is broken. And it cannot be fixed. But after watching Catskill use vibrations to get Leo’s attention, my wild and crazy idea was hatched. Vibrations! Bone conduction! What if this might help Leo? That’s why I ordered the Pocketalker Personal Amplifier 2.0 from Amazon. I envisioned Kelly, the director of animal care, holding the foam headset firmly along Leo’s tiny jawbones. Then, using the microphone of the Pocketalker, they could play the Reggae music they discovered he likes or speak to him directly. My theory was a long-shot. But I’m okay with long shots because it indicates we are in the game, still trying, and putting forth the effort to improve someone’s life. In this case, the someone is a tiny sunset-orange baby goat. And he deserves all chances we can provide him. This was my small gift to help him hear a few sounds. The Catskill team was eager to give this device a try. Kathy Stevens, founder and executive director, messaged me to say they looked forward to my visit the next month. Yes, I was scheduled to stay at their bed and breakfast before they adopted Leo. So, the timing was perfect. Leo would be out of quarantine by the time I arrived. Kathy indicated they welcomed my insights about hearing loss. They were determined to give Leo the best life possible. When I checked into the Homestead, Kathy texted so we could get together. The plan for Leo would be for Kathy, Kelly, and Veronica to meet me at Leo’s nursery where he sleeps. Veronica is the communications expert, so she would video us during the Pocketalker test run. Veronica shared that Leo was scheduled to visit Tufts University for another examination, so having a video might be helpful. That Saturday afternoon we met at Leo’s nursery. Kelly asked me lots of questions about hearing loss. She listened so intently that I almost flinched. Most folks get this glassy-eyed look after two minutes of hearing loss 101. But not Kelly – she thanked me for the insights and said I had given her a lot of new information. We were preparing to go sit with Leo when we realized time had gotten away from us. Kathy was scheduled to give another private tour at 1:00 PM. We were as disappointed as she was, but the private tours are important and life-changing for many. We promised to make a good video that she could watch later. Sitting in Leo’s backyard that September afternoon is a memory I’ll cherish forever. With all the rain Catskill received in recent weeks, the fields were saturated and muddy. That was of no concern. We were on a mission, so we unceremoniously plopped down on the grass next to Leo. My jeans were totally soaked within one minute. Same for Kelly. And Little Leo the blind and deaf baby goat – well, he just finished his lunch bottle, so he was mellow, happy, and soaking in the afternoon sunshine. We three humans were determined to carry out our plan. And I recall thinking how quiet we were – no chit-chat – as we needed to work fast before Leo fell asleep. Kelly and I did a quick sound-check on the Pocketalker, then she handed me the microphone. “Here, you go first,” she said. I was a bit surprised… and thankful for this kind gesture. Without wasting words, I took the microphone and began to speak to little blind and deaf Leo. I recall leaning closer to him like you would with a sleepy toddler. Kelly, Leo and I were as close as we could get. Veronica was taping every movement we made. So as Kelly adjusted the headphones on Leo’s skull, I continued to talk softly into the microphone. We gradually increased the volume on the Pocketalker. Then she repositioned the headsets to try a different spot on his head. If only Williams Sound (the manufacturer) could see how we were using their listening device! Bet they would be surprised. But their device works well in my personal life, so hey… why not for a deaf animal, too? Leo became very still and seemed to focus on something. Was it the sound? Was it the touch of Kelly holding the headset firmly to his head? We did not know, but Veronica continued to video us. Kelly kept a close eye on Leo’s body language. I began to sing to little Leo. Sitting in a mud puddle in the middle of Catskill Animal Sanctuary, I sang the first few lines of the song. Then I stumbled on the lyrics, so Kelly joined in and we finished the song together. That moment, that very moment, my heart just about burst with so much love for precious Leo, respect for Kelly and Veronica, and admiration for Kathy Stevens who created this amazing sanctuary. Seriously, we were sitting in a mud puddle hoping to offer Leo the goat a chance to hear more of his world. Yes, this was a long shot. We all knew it. Yet, they were gracious enough to give it a try. So, there we were, testing out a theory of bone conduction on a baby goat. My heart was pulling for a miracle for Leo. I hoped Tufts University would discover that Leo had residual hearing ability to detect at least some sounds. Finally, after patiently sitting with us as we played various music through the headphones, Leo fell asleep. At that point, I was able to soak in the moment. He was right there at my knee. I put one hand on him and looked at his face. He is blind and mostly deaf. Yet he is happy at Catskill Animal Sanctuary. He adores sleeping and snuggling in the laps of his humans at Catskill. Kathy recently posted that Leo surprised them by making his first climb on a rock! That’s a great milestone for a goat. They were thrilled. I am thrilled! What a lucky Leo. Even with his physical challenges, Leo is making progress. Leo the baby goat represents the innocence of all living beings, as we all want to belong to loving families and to be free to thrive in peaceful and safe homes. Oh, Leo. You’ve got that, pal. You’ve certainly got that! Dee, this was so delightful!